To keep the backup info safety, many users would like to set a password to protect iPhone backup. However, when you try to restore an encrypted iTunes backup and iTunes ask you to enter the password to unlock your iPhone backup, you forgot iPhone backup password. What can you do? Unfortunately, there isn't any official way to decrypt iPhone backup without password unless you use a third-party iPhone backup unlocker software. Here we collect the 8 best iPhone backup unlocker tools for you to select the best one for yourself. Part 2. Step by step Guide on How to Unlock iPhone Backup File? Tenorshare 4uKey - iTunes Backup is one of the best iPhone backup unlocker software that will 99% recover iPhone backup password no matter how complex it is. It uses advanced decoding technology to automatically detect encrypted iTunes backup files on your computer and analyze password types & structure to decrypt the iTunes backup password in a fast way. Keychain is a free utility to save and store passwords on Mac. If you have previously save your iPhone backup password in keychain, then you can easily find your backup password by going to Utilities > Keychain Access > Look for a keychain item named iPhone Backup > Show password in keychain. If you didn't save iPhone backup password in Keychain, it doesn't work. Learn more about How to Use KeyChain Access to Decrypt iTunes Backup Password on Mac. PhoneRecue is also a nice iPhone Backup Unlocker tool that embeds in its iOS data recovery software - PhoneRescue for iOS. It not only help you decrypt iPhone backup but also recover lost data and fix various terrible iPhone related issue. The cracking process will cost a much long time if your password is complexed. iSunShare iTunes Password Genius is one of the most professional iPhone backup password recovery tools in the market. It will help you unlock iPhone/iPad/iPod backup with 3 powerful iTunes backup password attack methods: Brute-Force, Mask, and Dictionary, and then you could restore data from your encrypted iTunes backup. Jihosoft iTunes Backup Unlocker is another award-winning iPhone backup password recovery tool. It offers you an easy and efficient ways to recover lost or forgotten iPhone/iPad/iPod backup password without any damage to your backup data. iSumsoft iTunes Password Refixer is a professional password recovery tool that offer you safe and easy recovering process to recover iPhone backup password. It provides you four attack types to recover iTunes backup password, with easy steps to use. Easy to use and risk free. iSeePassword iTunes Password Recovery is designed to unlock the password-protected iTunes backup files. It uses advanced password cracking mechanism to decrypt iTunes backup password, no damage to backup data and computer. Some users reported that it did not work on complicated and long password. UUkeys iTunes Backup Unlocker is capable of unlocking any password-protected iTunes backup. It has built 2 attack types to recover your forgotten iTunes backup password, including Brute -force Attack and Brute-force with Mask Attack, and works on Windows PC and Mac OS X. It does not equip dictionary attack. 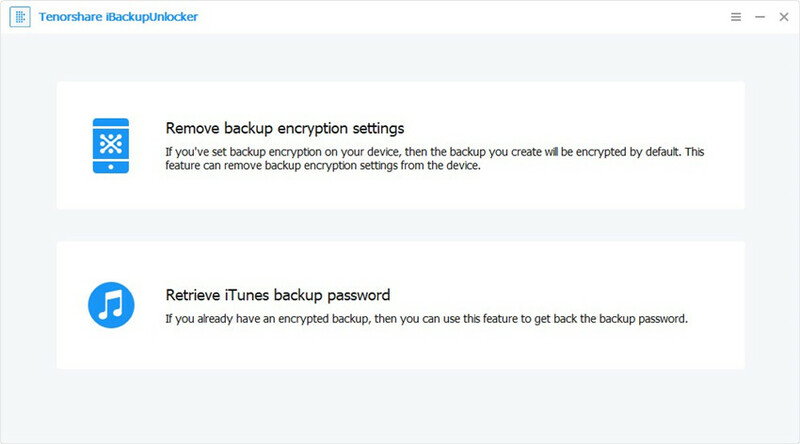 Below we take 4uKey - iTunes Backup for example telling you how to unlock iPhone backup file efficiently when you forgot iPhone/iPad/iPod backup password. To get started, free download this program on your Mac, Windows user can go for the Windows version. Step 1. Run iBackUnlocker on your computer. Click "Add" and then double click on the file you lost password from the drop-down box. Step 2. Choose a password attack type and click "Start" button. Within a while, the password is displayed in a smaller window. After comparing these top 8 best iPhone backup password recovery tools, can choose the one that fits you best to find and recover your iTunes backup password. From my top list, I highly recommend 4uKey - iTunes Backup as it is the only program that supports to remove iTunes backup password and encryption settings, and support the lasts Mac OS and works for all iTunes backup versions.